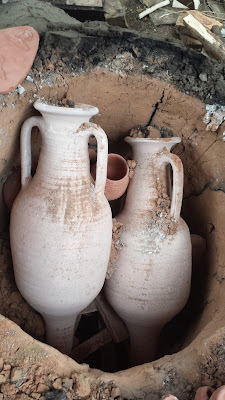 I'm a potter and experimental archaeologist, that means that I create replicas of ancient pots, make reconstructions of ancient kilns, firings, workshops etc. This blog is a journal of some of my recent work. All text and images are copyright if you wish to use them please ask. 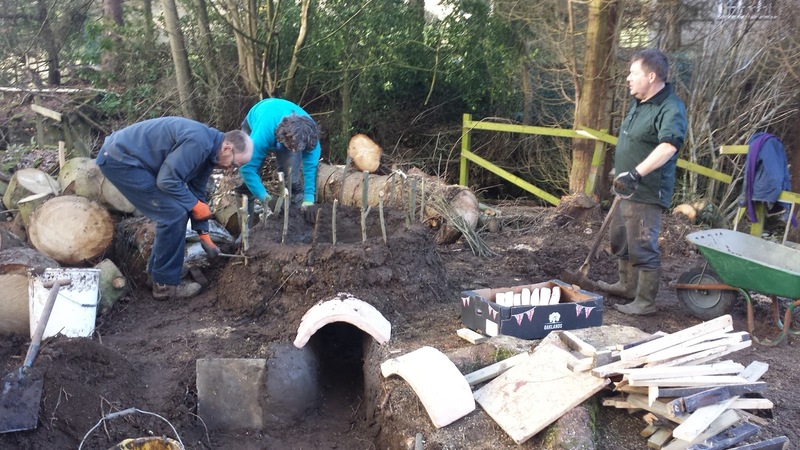 I'm really excited about this new collaboration with Vindolanda Roman Fort near to Hadrians Wall, the first stage has been to create a reconstruction of a Roman pottery kiln as a permanent feature of the site. Built with the help of a very enthusiastic team of Vindolanda volunteers, the kiln is sited in the valley, beside the burn, near to the museum and visitor centre, so look out for it next time you're there. 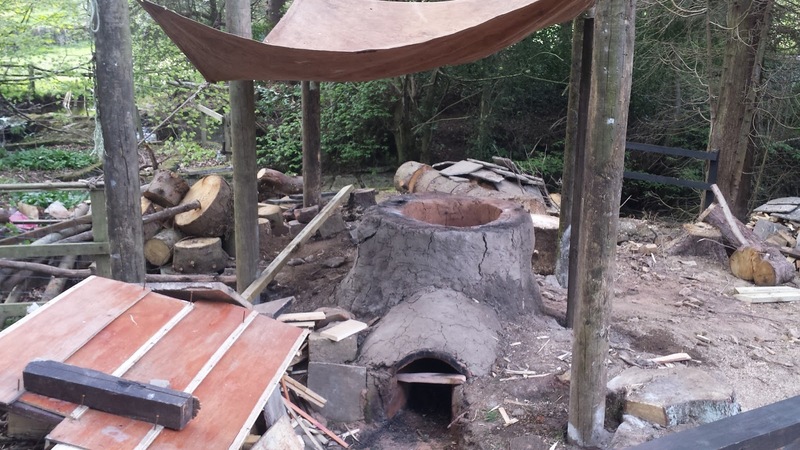 This fully functional replica of a Roman up-draft pottery kiln, is based on information gained from the excavation of such kilns at archaeological sites across the North of England. The body of the kiln itself (1) is constructed entirely from a mixture of materials found on site, Clay, Earth and plant matter such as straw. The internal floor and central support, (2) also known as Kiln Furniture are made from specially selected clay which will survive repeated exposure to high temperatures. While the kiln is cold, dry, raw pots are packed into the Ware Chamber (3) the top of the kiln is closed off with a temporary dome of clay and straw (4), leaving small holes as exit flues. 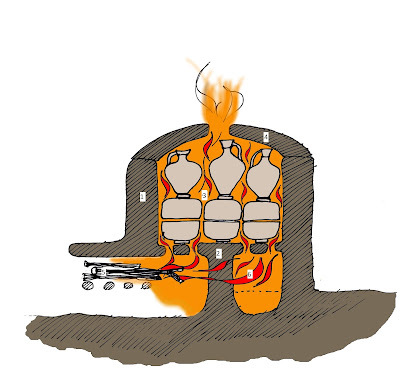 A small fire is then lit in the Fire Box (5) allowing hot gasses and flames to pass through into the combustion chamber (6) then up through the ware chamber. Starting slowly and steadily building up the fire the the pots are brought up to a temperature of between 8000 and 10000 Centigrade. 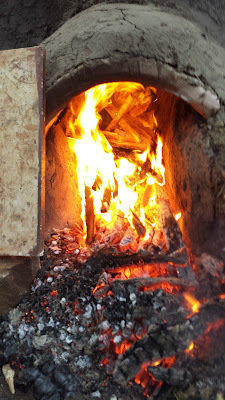 The first firing took many hours of constant stoking as we not only needed to fire the pots, but to dry out the structure of the kiln itself. Nevertheless we achieved a temperature of between 700 & 800 degrees Centigrade, hot enough to fire the kiln load which included two amphorae. This type of kiln would have been used by potters working in this region, to manufacture coarse wares such as Black Burnished Ware and Gray Ware cooking pots, indented bakers, plates, bowls, flagons and the like. While fine wares such as Samian Ware, Terra Sigillata and the Aphorae that carried produce around the empire would have been imported from production sites in Gaul and elsewhere in the Roman World. From now on I will be running regular Roman pottery workshops at Vindolanda where you will be able to learn the techniques and skills that went into making the ceramics of the Roman Empire. Workshops and courses will include: Kiln Building & Firing; Samian Ware; Barbotine Ware; Black Burnished Ware; Lamps & Goddesses; The Potters' Wheel, Roman Head Pots. For more information on these workshops, follow me on Twitter @PottedHistory, visit the Vindolanda website or email me info@pottedhistory.co.uk. Glad you like it Rod. There will be an information board next to the kiln, which will carry a similar illustration and explanation.